A new version adds book-related features, minor improvements, and parity with the latest iOS version. Pages 7 is the latest in a series of ongoing and gradual improvements to the 2013 “reboot” of Apple’s iWork suite or productivity apps, which also includes Numbers and Keynote. That reboot rewrote the apps from the ground up, but also omitted features that users had relied upon for years. Over time, many of these features were restored even as the apps expanded what they did in other areas. Pages 7 continues on this path. While it’s numbered as a major release to keep it in harmony with Pages for iOS, the iOS release has a greater number of significant additions. 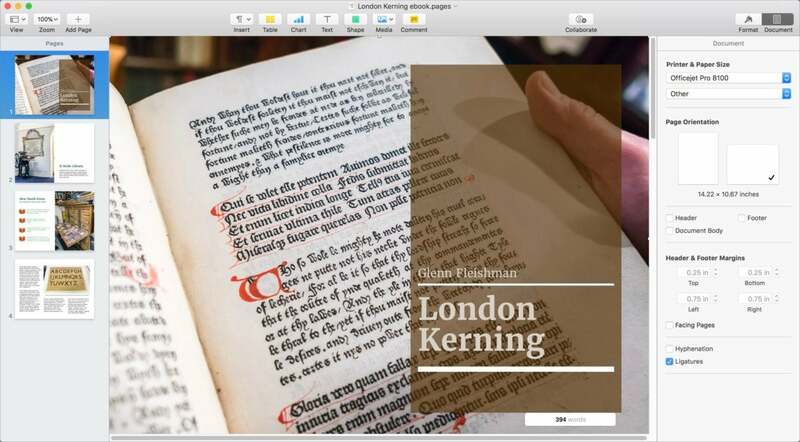 The flagship change includes book templates for interactive EPUB ebooks, allowing an end-to-end workflow for creating rich digital documents without the compromise of starting with templates and pages designed for printer output, even after all these years. 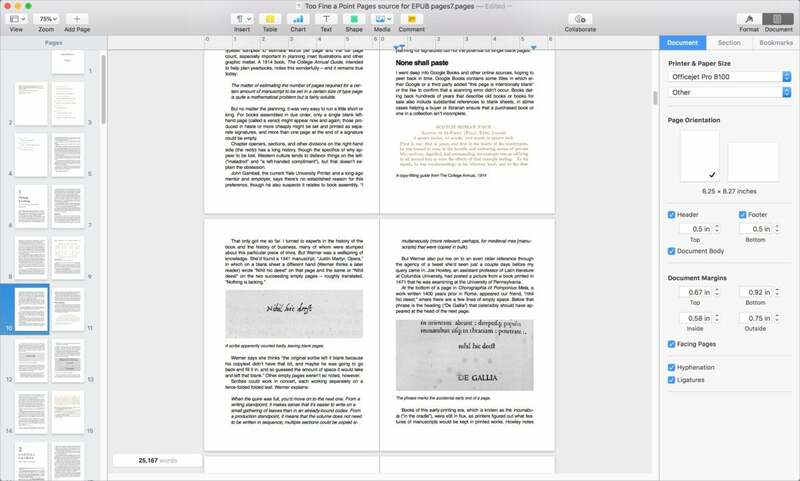 Alongside this new book workflow are two relatively obvious improvements for managing and producing documents: side-by-side page viewing within Pages (a feature that’s been missing for five years), and the ability to create two-page spreads (facing pages) when exporting layouts to PDF and EPUB. With both facing-page layout and side-by-side views, you can better work with and design books and large documents. Creating ebooks via Pages templates allows a streamlined and end-to-end workflow. You might be confused where iBooks Author fits into all this, and you’re not alone. The difference between it and Pages is now quite thin. iBooks Author offers a few kinds of additional interactive elements, like widgets, which offer animation and other touch-based responses. It also offers a live preview of the resulting EPUB output; with Pages, you have to export. Because Pages is a general-purpose app, it seems like a better route for most people to work in to create EPUBs and PDFs with this new release. Neither Pages nor iBooks Author edits EPUB files directly; they’re always exported from the app’s source files. Apple has gradually beefed up editing and collaboration features, including ever-better Track Changes and commenting options—they’ve been around for a while, but didn’t work well until a few releases ago—and real-time simultaneous document editing. Pages for iOS adds a beta of Smart Annotations in iOS, allowing graphical markup of a document with a Pencil for finger. These appear in the Mac release, but they can only be viewed or deleted. Since it’s a beta, it’s possible that will change, and allow you to “draw” with a mouse or trackpad. Reduce File Size can help compress files bloated due to multimedia that’s larger or includes more detail than needed. You can enable an Autocorrect option and type fractions that have special drawn versions in the typeface you’re using, and Pages automatically converts them. If you use charts and graphs in Pages, you can excitingly make use of donut charts, while tables have gained conditional highlighting based on values. Box document-sharing users don’t have to rely on iCloud for collaboration, but can work through Pages documents stored on that service as well. 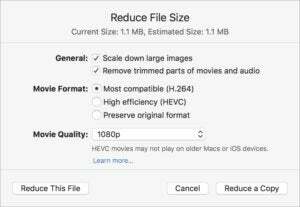 Apple offers a way to reduce storage consumed by audio, video, and images embedded in the document by opting to downsample or use more efficient formats (via File > Reduce File Size). Some features could use more explanation than that found in release notes and the functional-but-thin help files for Pages. For example, a new image gallery option makes little sense for page layout or word processing, and the how-to instructions give no insight on how you might use it. In fact, it’s an interactive feature that only works in Pages and when exported to EPUB, where it’s a useful addition. Pages 7 for macOS is a significant bump up for people who routinely produce documents shared digitally, whether as PDF or in EPUB ebook format.